In StonemontQC, a fraction represents the material retained on multiple adjacent individual sieves. For example, material passing the 1” (25 mm) sieve and retained on the ½” (12.5 mm) sieve can be defined as a fraction (Figure 1). Note that in this example the ¾” sieve would have been included in the gradation test and the 1” x ½” fraction would have included the material retained on the ¾” sieve. Many test methods allow the use of fractions rather than just the material retained on individual sieves. Hence, several StonemontQC worksheets have been designed to allow the use of fractions. 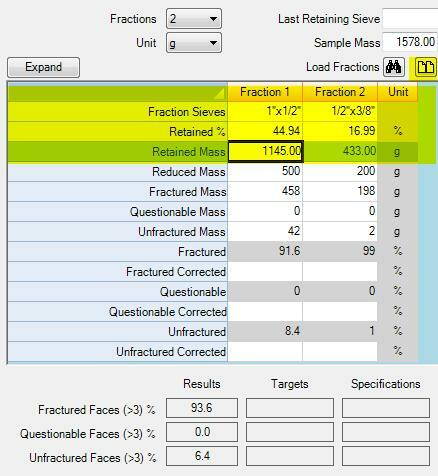 Fractions can be defined for each aggregate or asphalt product and then loaded into supporting worksheets. The fractured faces test method commonly uses multiple fractions (Figure 2). Rather than manually create these fractions each time a fractured faces worksheet is used, it is much more efficient to create the necessary fractions on the product once and load them into the worksheet with a simple button-click. Figure 2. Fractured Faces Worksheet Using Product Fractions.